by Soong-Chan Rah. Moody Publishers, 2010. Seminary professor and former pastor Soong-Chan Rah offers both theory and practice in an effort to help congregations understand the dynamics of culture, how to navigate them, and how to gain cultural competence in a multi-cultural country and church. Necessarily, then, Rah begins the conversation with all that the word “culture” entails. This includes a historical review of culture and race in America. 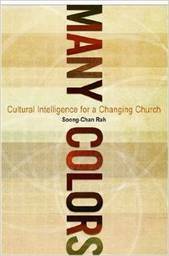 Part two of his work explores power dynamics and how multi-culturalism informs human behavior and leads to congregations becoming “culturally intelligent.” The most practical section of Rah’s work is in part three. Here he offers “real-life models and best practices of “cultural intelligence and competence.” The reality of systems in relationship to change and transformation is also addressed in part three. Rah’s perspective work is Evangelical Christianity, although other Christian perspectives can benefit by engaging in and studying this important and timely work.